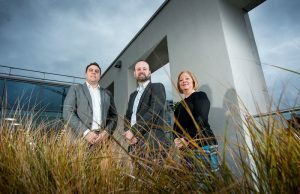 The recruitment industry across Yorkshire is thriving and shows no signs of slowing down. That is the verdict from organisers of the definitive run-down of the fastest growing companies in the region, the Ward Hadaway Yorkshire Fastest 50. Nathan Bilton, of Ward Hadaway, centre, with Andrew Maeer of Amsource Technology and Melanie Stead from Optimal PBS recruitment agency. According to information gleaned from its Fastest 50 lists between 2015 and 2018, the number of recruitment agencies making an appearance has doubled. These figures have emerged amid signs that the recruitment sector in the UK is becoming increasingly competitive and recruiters now have to think smarter and approach recruitment with more diverse digital strategies. Melanie Stead is Managing Director of Optimal People & Business Services which provides HR & Recruitment support to organisations across the UK. She says the use of digital technology is helping recruitment agencies narrow the candidate base down to exactly what skills are required for the role. She said: “The roles within a recruitment agency have changed. Data analysts and technology experts are now in these organisations. In addition to this, recruitment consultants are working hard to build relationships with their clients and candidates to help understand what their drivers and motivators are, ensuring there is an alignment of values between them both. “Clients are demanding a much improved service from recruitment agencies, expecting them to understand their business model, their brand, their strategy and their culture and the top recruitment consultants across the industry have really stepped up to that challenge. “Good recruitment agencies are looking for a long-term relationship with their clients and their candidates, not just a quick fee for a one-off role. Nathan Bilton, an Associate in Ward Hadaway’s Commercial team in Leeds, has seen the effects of this increasing presence. Nathan advises a number of those in the sector on commercial arrangements and contracts. He has particular experience in the IT and education sectors, and also provides advice to recruitment agencies in respect of data protection. He said growth in the recruitment industry has been driven by Yorkshire as a fast-growing county. “If we look back at the number of fast-growing recruitment agencies appearing in our Yorkshire Fastest 50 lists over the years, we can see there weren’t any recruitment companies within the list for 2014, but our research has shown that the momentum has gathered pace since then. “The rise in the number of agencies in our list during 2018 is testament to the positive mood within the region and within the recruitment industry sector as a whole. “Despite the current uncertainty with Brexit, immigration issues and evolving technology, the recruitment industry has continued to flourish, boosting our regional economy. “Recruiters are not only seeing an increase in demand for the services of recruitment agencies, they’re taking advantage of favourable market conditions and the opportunity this represents for aspiring entrepreneurs. Andrew Maeer, owner and Managing Director at Amsource Technology in Leeds, said: “The recruitment industry is undertaking a fundamental change in the way it operates. The traditional, transactional method of just providing a CV is no longer the accepted norm. Recruiters now work in partnership with organisations and provide a service that adds significant value to that organisation, not just increasing headcount. He added that AI is on the rise in the recruitment sector with chatbots being the first to provide this solution, but that skills matching that technology are still in their infancy. Castle Employment, Caval, Consult Search and Selection Limited and Logical Personnel Solutions all made an appearance in 2018’s list compared to just two companies featured in 2015, which included Concept Recruitment Group Ltd and GatenbySanderson. By the analysis of company financial figures, the Ward Hadaway Yorkshire Fastest 50 identifies the privately-owned, profit-making companies which have seen the biggest annual expansion in their turnover in recent years. This process will create a definitive list of the 50 fastest-growing companies in Yorkshire which will be published in March. Then on March 22 at a special event at Aspire, awards will be handed out to the fastest-growing small, medium-sized and large businesses, for companies with annual turnover of between £1m and £7.5m, between £7.5m and £25m and turnover of more than £25m respectively. One of those three winners will then receive the accolade of being crowned Yorkshire’s overall fastest growing business for 2019. This is the ninth time that the Ward Hadaway Yorkshire Fastest 50 has taken place, and the event has become a firm fixture in the region’s business calendar.